Amish are busy in Lancaster county harvesting corn and the dust was flying as dry weather kept moisture way down.A second wagon waits for the signal to fall in and keep things moving. All I can say is this county produces a lot of corn in one season. 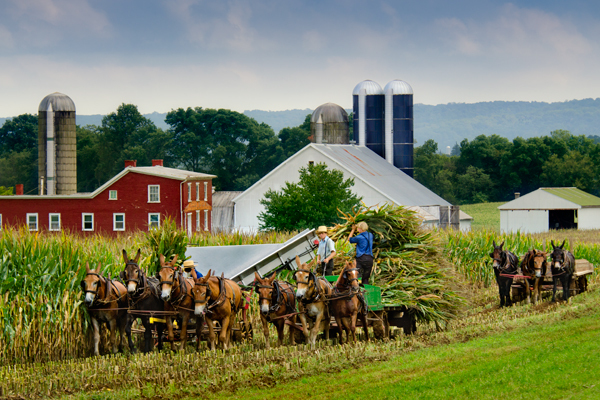 This Amish family is hard at work on a warm september day harvesting their corn crop. One wagon moves along to catch the freshly cut stalks until it is full, and the next empty wagon is heading up the field to take its place when needed. This year has been a banner year for corn and fields will be a buzz with activity in the coming weeks. 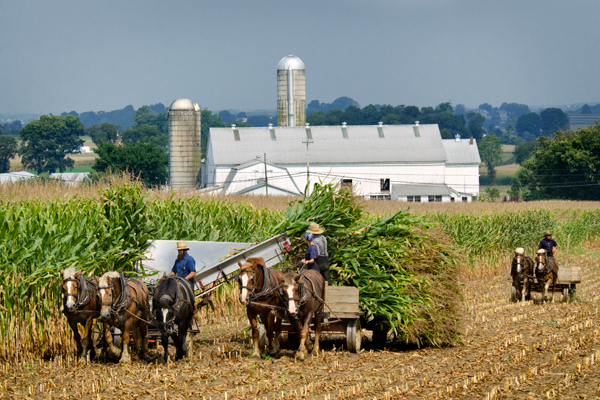 The Amish farmers have been busy in the last month harvesting thousands of acres of corn. Wet weather has delayed the work slightly,but it doesn’t take them long once they get going. I usually like to find a nice farm in the background,so the viewer can see the whole setting,instead of just the wagons. 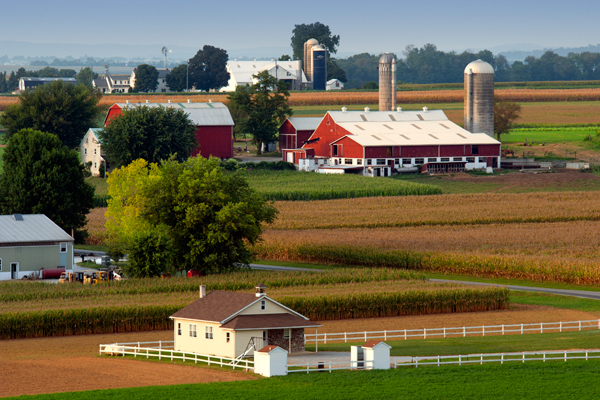 A hilltop vista includes a one room school in the foreground and several farms dotting the landscape. A telephoto compresses the distance between each. Corn crops are ready to be harvested. 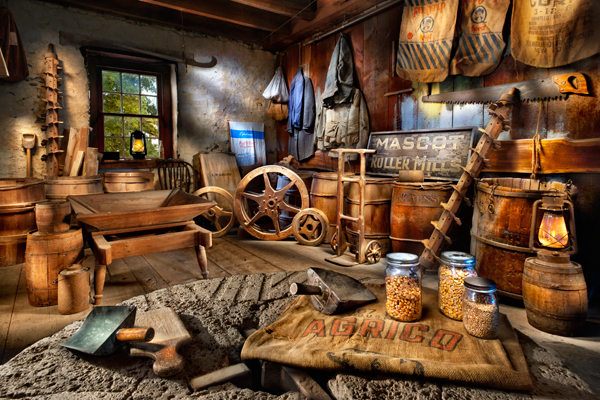 Todays image is another from my series taken at an old mill, and features a room full of old wooden barrels, along with a variety of tools used by the mill in its heyday. The round stone, serving as a table in the foreground weighs 2000 lb and is not going to move anytime soon. The image was shot using deer spotlights that I have placed diffusion on to soften the light output, and each exposure was approximately 30 seconds in an almost totally dark room. The windows were covered with black fabric to block the outside light from having any influence on my light painting, and were uncovered at the end to get the window detail. The lanterns were lit only by my spotlights to give a glowing effect. Because the spotlights are so intense, I use a technique where I pulse the trigger on briefly ,then off and keep moving across the scene till the shutter closes. A half second worth of spotlight is all it takes to light an object at f11 or f16 at iso 200. I also use a fairly inexpensive wireless remote to fire the camera from across the room, so I never touch the camera once I get started.